Space Saver high chair, designed to sit in a standard dining chair. Has Straps to secure high chair to dining chair. Reclines, 5-point harness, and has a tray. Pull up a chair at the dining table. The Houston Space Saver Highchair Rental straps securely to just about any kitchen chair, dining chair or restaurant chair to give you and baby all the features, comfort, and convenience of a full-size high chair… in only half the space! This space saver high chair has three height adjustments. Three recline positions. Removable, dishwasher-safe, easy to clean feeding tray insert. One-hand tray removal. Machine-washable seat pad and five point restraint — it’s got it all! 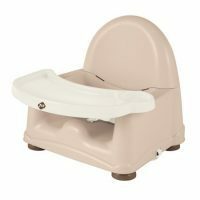 As your little one grows, this Houston space saver highchair rental easily transitions from reclining high chair seat for newborns, to an upright high chair seat for infants, to a comfortable, height-adjustable “big-kid” booster seat for toddlers! Its compact size makes it perfect for use in small spaces, or on the go. 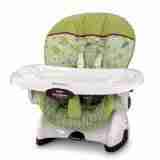 Height and tummy adjustments, plus a recline feature – for growing babies from infant to toddler! Use only with children capable of sitting upright unassisted. Never use booster seat on a stool or bench that does not have a seat back. Our cleaning process is extensive. Rockabye uses a hospital grade cleanser to clean each Houston space saver highchair rental, then 160 degree steam is used to remove any residue and to kill possible exposure to bedbugs and lice. No other baby equipment rental company in Houston offers this level of sanitization. Read more about our cleaning process. If you depart prior to pick up; then call to notify us so we can reschedule your Houston space saver highchair rental pick up time.